With The Gift of the Magi, Leslie Arden has created a shining gem of a musical. Arden, who wrote not only the music but also the book and lyrics, has based the show on two well-known stories by the American author who wrote under the pen-name O. Henry (1862-1910). The musical, now receiving its world premiere at Theatre Orangeville could not have better advocates than its present top-notch cast. The two stories Arden has used are “A Retrieved Reformation” from 1903 and “The Gift of the Magi” from 1905. The first story forms the first act. Career criminal Jimmy Valentine has just been released from prison much to the anger of the detective Ben Price, who worked so hard to put him away. Jimmy goes back to the apartment where he hid his specialized set of safe-cracking tools and sees his friend Mike, who aided him on a bank job, and Mike’s wife Bessie, who is ignorant of her husband’s activities. Jimmy moves out to Elmore, Arkansas, and begins scoping out the local bank as a target. At the same time he can’t help but notice the independent-minded bank teller Annabelle Adams. The two fall in love and the question is whether his love for Annabelle is strong enough to cause him to give up crime and choose an honest way to make a living. In the second story Jimmy has married and moved to New York. Since the shoemaking factory where Jimmy was employed has closed the couple have almost no money. Yet, at Christmas each wants to give the other a present they know they cannot afford. Each does find a way to acquire the needed money but the way they acquire the money makes the gifts they choose for each other heavy with irony. Arden does not explain the title as does O. Henry, who concludes the story by saying, “And here I have lamely related to you the uneventful chronicle of two foolish children in a flat who most unwisely sacrificed for each other the greatest treasures of their house. But in a last word to the wise of these days let it be said that of all who give gifts these two were the wisest. O all who give and receive gifts, such as they are wisest. Everywhere they are wisest. They are the magi”. Although the two stories were originally unconnected, Arden has made a few tweaks to the first story so that it becomes the background for the second. In O. Henry’s story safecracker Jimmy Valentine falls in love with Annabelle Adams. Arden has Jimmy take on the alias James Spencer, not Ralph Spencer as in the original, and she changes Annabelle’s name to Adeline, which allows her to be called Della for short. The second story originally concerned James Dillingham and his wife Della. Arden thus already has her Jimmy and Della, but their last name is now Spencer. “The Gift of the Magi” concerns Jimmy and Della’s most prized possessions – Jimmy’s watch, inherited from his father, and Della’s long, beautiful hair. To give these two possessions even more weight, Arden creates a backstory for them that she inserts into “A Retrieved Reformation”. Detective Price has kept Jimmy’s watch for himself hoping that Jimmy will tell him his accomplice’s name in exchange for the watch. As for Adeline, we learn that she keeps her hair long in honour of her mother who prided herself on her long hair. Arden also links the two musically. In Act 2, she has Jimmy, who is frustrated at having no money to buy a present, briefly contemplate a return to his earlier life. He reprises the opening chorus about the unrepentant Jimmy Valentine and reprises Ben Price’s negative view that criminals do not change. For a moment we fear the worst, but luckily our fears prove unwarranted. Arden’s music is quite sophisticated, as one might expect from someone who studied with Stephen Sondheim. The musical begins with the five adult cast members singing a chorus about the criminal Jimmy Valentine that may remind musical-lovers of the opening chorus of Sondheim’s Sweeney Todd, both legendary criminals though Jimmy’s crimes are hardly as grotesque as Sweeney Todd’s. As in Sweeney Todd, this menacing chorus recurs when another bank robber adopts Jimmy’s modus operandi, thus leading Price and the general populace to believe Jimmy has returned to his old ways. Arden’s libretto tends to have three beats per line, as do Sondheim’s, and to alternate between angular sequences and melody. What will especially endear the musical to all manner of theatre groups is its use of a children’s chorus. In Act 1, they serve as the newspaper boys who periodically rush out singing “Extra! Extra!” about the presumed latest exploits of Jimmy Valentine. In Act 2, Arden ingeniously integrates traditional Christmas carols sung by the adults and children into the fabric of the musical. The musical has a lively dance sequence in Act 1 choreographed by Kiri-Lyn Muir when Jimmy teaches the Adeline and her friends the one-step. There Arden’s music easily encompasses the old fashioned style familiar to most people as the basis for the cakewalk. The whole musical is marked by careful design always with an eye to dramatic effectiveness. Mark Uhre, familiar from his work at the Shaw Festival, leads the top-notch cast as Jimmy Valentine. The work could have been written for Uhre’s voice since it showcases so well its power and his many hues. Jimmy Valentine has the most complex journey of any of the characters, beginning as a cynical materialist only to fall in love, to wonder at the changes love has wrought and then to have to feel shame that he cannot support his wife as he would like. Uhre masterfully convinces us of every stage of Jimmy’s transformation. 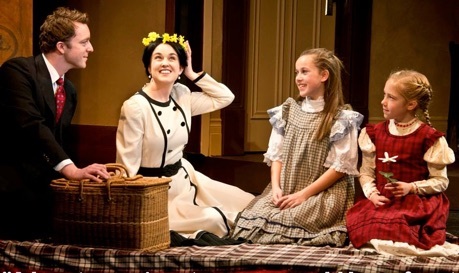 Mairi Babb, well known from shows for Drayton Entertainment, has a light, pure soprano that admirably suits her role. Adeline Adams is also a conflicted character – a would-be feminist who longs to see the world but is stuck in a small town and has to put up with its conventional attitudes. Falling in love means a change in attitude for Adeline as much as for Jimmy since she has to reassess her antagonism to marriage. Babb makes Adeline a spirited figure with whom everyone will empathize when she must make her wrenching decision in Act 2. Cyrus Lane, known from his work at the Stratford Festival, is impressive as Detective Price. His character’s determination to catch Jimmy Valentine despite Jimmy’s having served his time in prison lends Price the aura on a smaller scale of Javert in Les Misérables. Indeed, Lane plays Price as if he were as obsessed as Javert with catching his prey. Luckily, Lane’s Price, unlike, Javert, has not lost all human feeling to his obsession and is capable of movingly altering his opinion of Jimmy when the facts demand it. 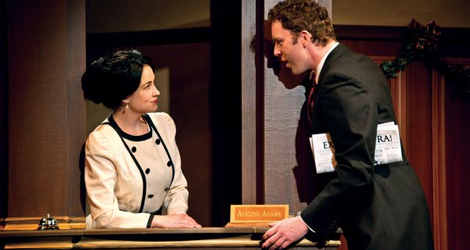 Cory O’Brien and Glynis Ranney, both at Stratford this year, play multiple characters. O’Brien clearly distinguishes his four characters ranging from Jimmy’s cheery but secretive pal Mike to the aged, easily befuddled banker Mr. Adams. Glynis Ranney is careworn as Mike’s wife Bessie, carefree as Adeline’s friend Flora and exuberant as the wig maker Madame Sofronie. Arden gives Sofronie a marvellously exotic song, an aria really, that Ranney carries off with real panache. No discussion of the acting would be complete without mentioning the amazingly assured performances of Hayla Howat and Lindsay Scheel as Agatha and May, Flora’s two mischief-making daughters. Set designer Beckie Morris has wisely decided to use a revolve in this production, divided into three equal sections, to facilitate the changes from scene to scene. Alex Amini’s costumes accurately reflect the period of the action and the personalities of the characters, the wildest costume being for Madame Sofronie. David Nairn directs the musical with a fine sense of pacing and inventive use of the performance space. At the piano Arden accompanied the musical herself. There are so many colours apparent even in the piano version one hopes that Arden will be able to rescore the work for a small ensemble, even a piano trio or piano quintet, to bring out these colours more fully. Based on well-known short stories and written for five adult singers, two child performers and a children’s chorus, The Gift of the Magi is such a fine addition to the small collection of Christmas musicals that it is sure to be a gift to theatre companies across North America. Unlike so many holiday musicals, Arden is dealing not in fantasy but in real human dilemmas. In particular, Arden’s new musical emphasizes that forgiveness is one of the key virtues not just of the spirit of Christmas but of life in general. Photos: (from top) Mairi Babb and Mark Uhre; Cyrus Lane, Mark Uhre, Cory O’Brien, Glynis Ranney and Mairi Babb; Mark Uhre, Mairi Babb, Lindsay Scheel and Hayla Howat. 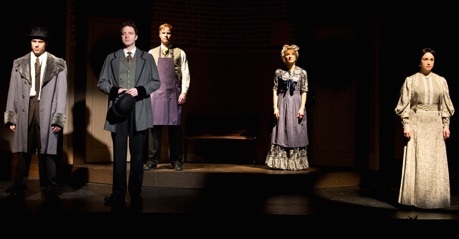 ©2015 Theatre Orangeville.